Chase Allen American Made Winner! 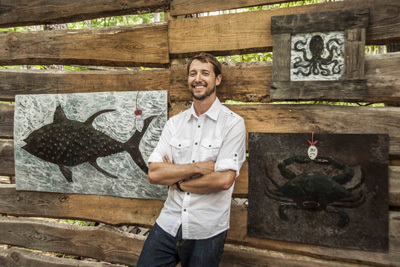 Chase Allen isn’t just a local artist or the owner of The Iron Fish Gallery on Daufuskie Island, now he’s the Audience Choice for Martha Stewart’s American Made competition. But really, he’s a craftsman who loves what he does and wants to help others out. 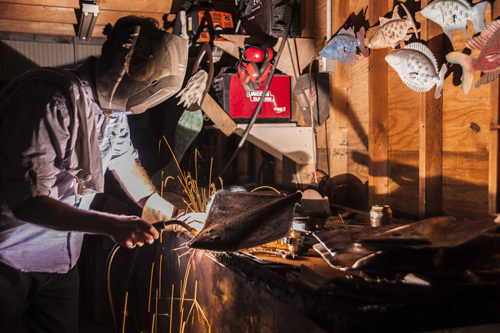 After acquiring a degree in marketing and working in sales for a year, Chase realized that the office life was not for him, so he moved to Daufuskie Island with a knowledge of how to weld. And for the next couple of years, he welded found pieces of metal together, making abstract art. It wasn’t until 2004 that he found his focus and main source of inspiration – the coastal life. He decided to make sculptures of things that he enjoyed – the outdoors and fishing – and it turned out to be the right decision. 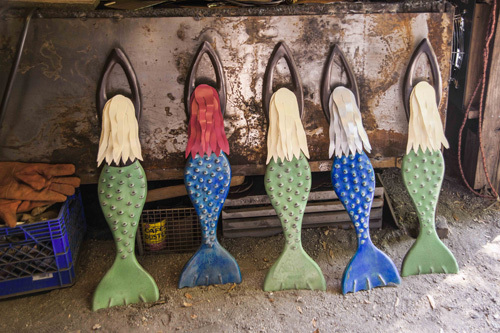 The series of fish and mermaid he made sold immediately, so he decided he’d make a few more. 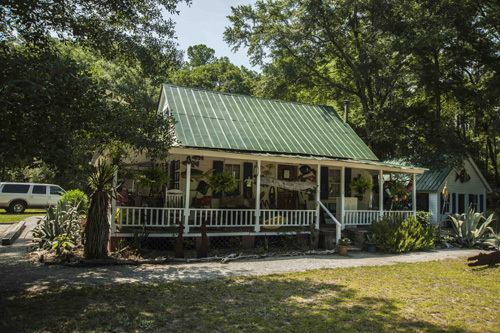 When he started, he was working in a tent next to an old Gullah cottage but after about five years, he was able to purchase the cottage and even build his own studio to work out of. Now customers can come by, roam through his shop and even see him in a sea of sparks, welding next door. After a customer nominated him for Martha Stewart’s American Made competition, Chase had to compete against artists making everything from quilts and floral arrangements to skincare products, compost and pasta. But he decided he wasn’t just going to do this for himself; he was going to do it for Claire Desmelik, a friend from high school, who just found out that her 6-year-old son, Holmes, has a brain tumor. Chase found out that he won and was named the American Made Audience Choice after a month of voting. On November 6, he and his wife were flown out to New York to meet Martha Stewart and attend several dinners and events. But instead of keeping the prize of $10,000, Chase donated all of it –$7,000 to the Desmelik’s to help with their medical bills and the other $3,000 to the Alzheimer’s Association, Ankylosing Spondylitis Association, Doctors Without Borders and a scholarship fund for any high school student interested in learning blacksmithing at John C. Campbell Folk School. Before Chase even found out he’d won, he made plans to go with a friend to the Leaf Festival, a family-friendly music festival in North Carolina, and Claire happened to be going. It’s there Chase got to meet Holmes. Claire gave him a “Holmes Team” T-shirt and he officially became part of the Desmelik’s support group, which has just over 2,000 members. Because of Martha Stewart’s contest, new customers were able to find out about Chase and he was able to help Holmes. Chase said that he’s very thankful for the award and that he wouldn’t have received it without his loyal customers and everyone who believed in the causes he was supporting. And despite his generous donation, Chase does not want the spotlight to stay on himself.